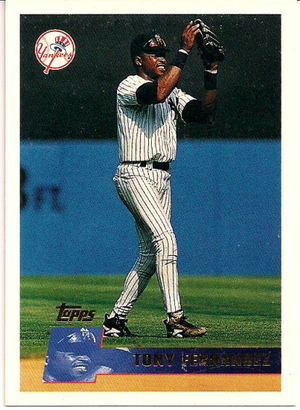 After the 1994 postseason, the Yankees signed this four-time Gold Glove winner as a free agent to become their starting shortstop. He did not have a very good 1995 season, hitting just .245, although he did become the first Yankee to hit for the cycle since Bobby Murcer pulled it off in 1972. But the Yankees thought Fernandez would provide more offense and when he failed to do so, Bucky Showalter started giving Randy Velarde some starts at short. Then Fernandez got hurt late in the year and while he was on the DL, he watched a young prospect named Derek Jeter fill in at his position. New Yankee manager, Joe Torre decided Jeter would be his starting shortstop in 1996 but his plan was to make Fernandez his starting second baseman. That went up in smoke when Tony broke his elbow during spring training and missed the entire 1996 season. The Yankees let him go after his two-year contract expired and he signed with Cleveland. Fernandez played until 2001 and retired with a .288 lifetime batting average and 2,276 hits. Tony shares his June 30th birthday with this former Yankee utility outfielder, this one-time Yankee third baseman and this one-time Yankee reliever. When then Manager, Yogi Berra slapped the harmonica out of Phil’s hands on that infamous 1964 Yankee bus ride, Yankee fans would never had guessed that the seemingly quiet and shy Linz was possible of such defiance. In actuality, Linz was a whacko. He and the even crazier Joe Pepitone had come up through the Yankee farm system together, leaving a trail of behavioral incidents that would have made Charley Sheen blush. Linz spent four seasons in pinstripes as a utility infielder. He had a good glove and displayed a good enough bat to see plenty of action during his first three years in the big leagues. 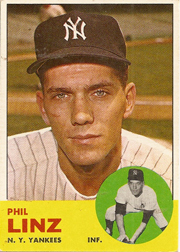 In fact, Linz started and led off every game of the Yankee’s 1964 World Series against the Cardinals. The two home runs he hit during that Fall Classic would be the highlight of his Yankee career and also the turning point. In 1965, Linz pretty much stopped hitting, averaging just .207 in 99 games. So when Tony Kubek’s bad back forced the Yankee stating shortstop’s early retirement at the age of 29, Linz was bypassed for the job. Instead, New York traded him to Philadelphia, for their starting shortstop, Ruben Amaro. Linz bombed as a Phillie and then played his final two big league seasons as a backup infielder with the Mets. Phil shares his June 4th birthday with this Yankee coach who as a big league catcher invented the “sit-down strike.” This long-ago Yankee outfielder was also born on this date. At the beginning of the 1908 season, New York Manager, Clark Griffith got into a dispute with the team’s owners and was dismissed. Elberfeld happened to be injured at the time so since he was being paid anyway, the Highlander brain trust made him the team’s Manager. The results were disastrous. The umpires hated him and so did his own players. He piloted the team to an almost comical 27-71 record during the rest of that 1908 season and his big league managerial days were over forever. He played one more season for New York before getting sold to Washington where he was reunited with Clark Griffith. Also born on April 13th is this older brother of a former Yankee pitcher and this WWII era third baseman. Last September, the Yankee front office was about to announce that Derek Jeter’s frustrating 2013 season was over. 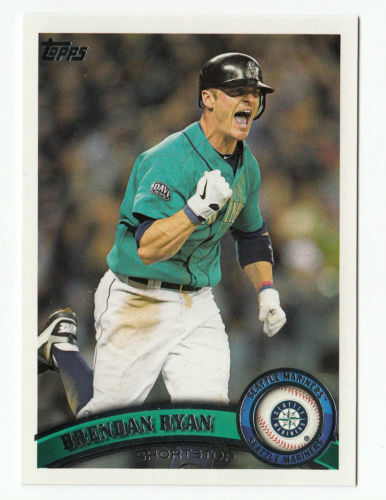 Before they did, they acquired another big league shortstop by the name of Brendan Ryan. At the time of the announcement, I had never heard of Ryan, which was odd because he had been the starting shortstop for both the Cardinals and Mariners for two seasons each. Unlike Jeter, who was one of baseball’s all-time best-hitting shortstops, Ryan was not a good hitter, averaging just .237 during his almost 700 games in the big leagues. Also unlike Jeter, Ryan was considered one of the very best defensive shortstops in the game. The Yankees then signed their new acquisition to a two-year contract for $4 million. I was a bit puzzled by the contract until the Yankees went on their free agent signing spree during the offseason and reloaded their offense with Jacoby Ellsbury, Brian McCann and Carlos Beltran. So even if Jeter could not make it back in 2014, the rejuvenated Yankee lineup could score runs without his offense and by using Ryan at short, they could prevent more runs on defense. It seemed a sound strategy. 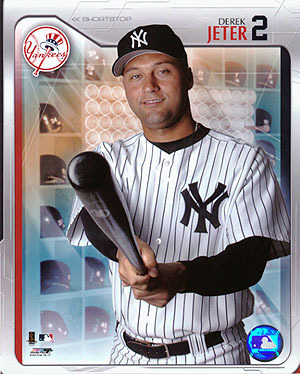 Ironically, as we approach the end of the first month of the 2014 season, it is Ryan who is on the DL and unable to play, while Jeter looks like he will do just fine in this final year of his brilliant playing career. Ryan was born in Los Angeles on this date in 1982 and was selected by the Cardinals in the 7th round of the 2003 draft. He bats and throws right-handed and can play second and third in addition to short. He shares his birthday with this former Yankee infielder and this pacifist WWII era pitcher. One of the Yankees most impacted by the infamous Copa Cabana Nightclub incident wasn’t even there celebrating that night. I’m referring to Woodie Held, a rather free spirited middle infield prospect for New York in the fifties who along with alleged troublemaker Billy Martin, pitcher Ralph Terry and an outfielder named Bob Martyn were traded to Kansas City for reliever Ryne Duren and outfielders Jim Pisoni and Harry “Suitcase” Simpson. Both Martin and Terry would get a chance to return to New York and capture glory in pinstripes. Bob Martyn would never enjoy much success in the big leagues. But Held would go on to play fourteen years in the big leagues and belt 179 home runs. Back when I was a kid, I collected baseball cards, which in addition to the annual Street & Smith’s Baseball Preview issue were my primary information conduit for the performances and stats of non-Yankee players. I remember checking the backs of cards of every player to find out what teams they played for. It was most likely on the back of the 1961 Woodie Held card pictured with this post that I found out he used to be a Yankee. Once you were a Yankee, I continued to root for your success except when your team happened to be playing the Yankees. That is how and why I became a fan of Woodie Held. I loved his name and I loved the fact that he played in the middle of the infield but could still hit for power. I remember the year I got this card, Maris and Mantle were chasing Ruth but Skowren, Berra, Howard and Blanchard all had more than 20 home runs that season while Clete Boyer (11), Bobby Richardson (3) and Tony Kubek (8) didn’t reach that milestone. 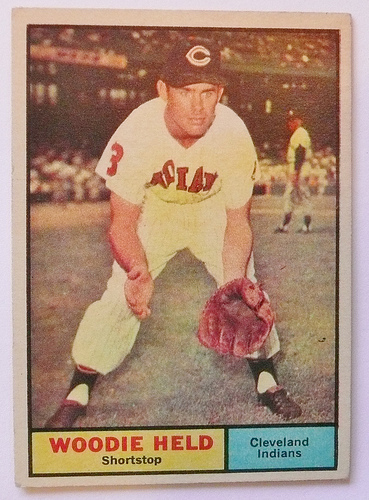 I remember looking at Held’s card and seeing he had hit 21 home runs as a shortstop for the Indians in 1960 and 27 the season before. He would hit 23 during the ’61 season. I remember hoping some day he’d return to New York and hit all those home runs as a Yankee shortstop. Of course back then, I didn’t realize that would have been pretty difficult for Held to do since he was a right-handed pull hitter and probably, just like Clete Boyer ended up doing, many of Woodie’s blasts would have been turned into outs by Yankee Stadium’s cavernous left field. In any event, Held never did come back to the Yankees. 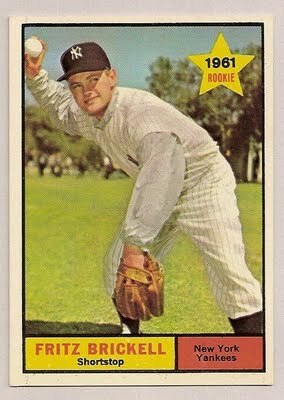 He hung on in the big leagues until 1969, quitting when he was 37 years old. He then enjoyed one of the most erratic retirements of any big league player in history. He opened a pizza parlor, ran a lumber yard, he raced snowmobiles, became an iron worker, he worked as a bartender and an electrician. Woodson George Held died in June of 2009 in his adopted home of DuBois Wyoming at the age of 77. He shares his March 25th birthday with this former Yankee outfielder and coach. You’d have to be close to my age to remember a shortstop by the name of Freddie Patek, who started for the very good Kansas City Royal teams of the 1970s. Patek’s nickname was “the Flea” because he was tiny, just 5’5″ tall and also a real pest for Royal opponents to deal with. He had good speed, was a heck of a bunter and every time you looked up he was moving a runner into scoring position, beating out a slow grounder or stealing a base. Patek was the guy I thought about as I completed my research on today’s pretty obscure Pinstripe Birthday celebrant named Fritz Brickell. Like Patek, Brickell was a 5’5″ shortstop. But unlike Freddie, Fritzie never became a real pest for Yankee opponents at the big league level. Brickell’s dad, also named Fred, had been a Major League outfielder back in the twenties who played against the Yankees in the 1927 World Series. In addition to being short, Brickell had the additional misfortune of being a middle infielder in a Yankee organization during the fifties that was loaded with great middle infielders. Nevertheless, when Fritzie took over for Tony Kubek as starting shortstop for the Yankee’s AAA team in Denver in 1957, he banged 170 hits and averaged .295. That performance convinced the Yankees he deserved some look-sees at the Major League level. The 1959 Yankee club was one of the most disappointing teams in the franchise’s history. They finished in third place in the AL that season with a 79-75 record. They were playing .500 baseball in June when Brickell was called up. Manager Casey Stengel played him in 18 games during the next six weeks and Fritz hit his one and only big league career home run off of Detroit’s Tom Morgan. Unfortunately, given his small strike zone, Brickell did not like to walk. Kubek’s job was safe. The Yankees sent Fritz back down to Denver at the end of July. The next time he played in Yankee Stadium was 1961 and he was wearing the uniform of the Los Angeles Angels. The Yankees had traded him to LA in April of that year to reacquire Duke Maas. Maas had been a valuable member of the Yankee pitching staff during the previous three seasons but when New York left him unprotected in the AL Expansion Draft of 1960, the Angels snatched him. Brickell was the Angels’ first ever Opening Day starting shortstop but after 21 games he was hitting just .122 and was released. Four years later he was dead, a victim of cancer, at the age of 30. Brickell shares his birthday with this long-ago starting outfielder for the New York Highlanders.